Having a rambunctious toddler and a new baby in the house doesn't leave much time for cooking. But too much take-out, even if it is the easiest option, only leaves us feeling gross and devitalized. And given the sleep-deprivation that comes with a newborn, we really need all the energy we can get. So we have been making a concerted effort to still eat healthily despite our lack of free time (the green smoothies really do help!). We recently discovered that whole grain bowls are a super easy, no-fuss, feel-good dinner that we can whip-up in literally no time at all. I've been cooking up a batch of whole grains (either quinoa, farro, brown rice etc) in advance, and storing it in the fridge. Then all we have to do is throw in whatever veggies we happen to have on hand, as well as some protein (stir-fried tofu, canned beans, edamame, or a crispy egg), and douse it with sauce. And voilà, a balanced, healthy, mouthwatering meal. But the real trick, my friends, to a truly outstanding grain bowl is to have a truly outstanding sauce to go with it. And that's what I want to share with you today... Two of our favourite grain bowls and the sauces we always make with them. 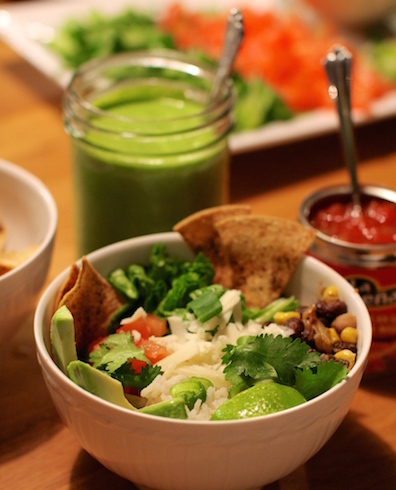 The first is a Mexican-inspired bowl with a creamy avocado cilantro lime dressing (amazing! 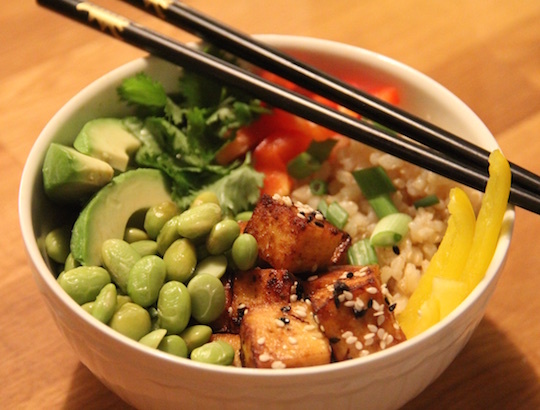 ), and the second, an Asian-inspired bowl with a deliciously sweet sesame ginger garlic dressing. 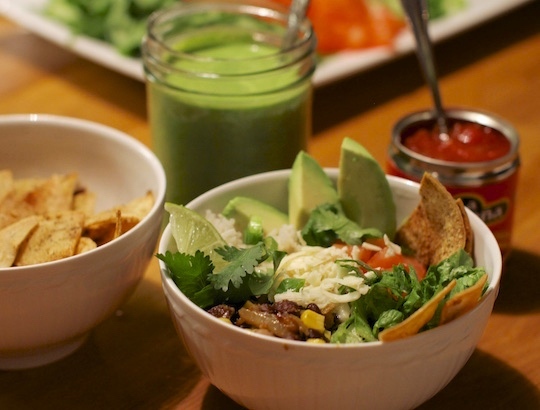 So for this bowl we always make a batch of avocado cilantro lime dressing (recipe follows). This stuff is amazing, and makes everything taste better... unless you're one of those weird people that hate cilantro (I'm looking at you, dad), because this dressing contains a lot of cilantro! We usually start our bowls with a base of warm brown rice or red quinoa, but you can use any grain you want. Then we add in some black beans (that have been stir-fried with a little oil, onion, garlic powder, salt & chili powder, and some canned corn). Then we top it with grated cheese, avocado slices, chopped spring onions, tomatoes, lime and some salsa. Maybe even a few tortilla chips. Hey, why not? And just before we douse our bowls in that incredibly creamy delectable green sauce, we take a moment to marvel at how yummy all those colours, textures and flavours look together.... and then we mix everything together like mad and dig right in. It's heavenly! 1 bunch of cilantro, rough stems removed (but use the softer stems - they're full of flavour), approximately 1&1/2 cups, packed. 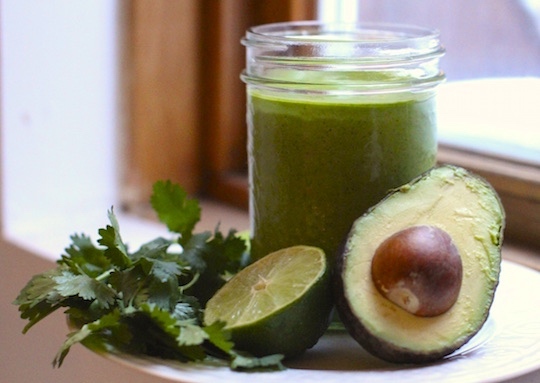 Puree all ingredients together in a blender or food processor until smooth. Taste and adjust seasonings if necessary. Thin out with water, if desired. 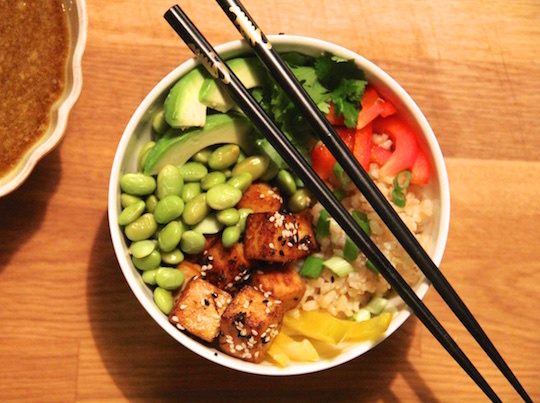 For our Asian-inspired grain bowl, we start with some cooked brown rice or farro, then we add in sautéed tofu cubes and shelled edamame beans (we always keep a bag of these in our freezer). Then we add in some chopped raw veggies, like red & yellow bell pepper slices, spring onions, avocado slices, and sesame seeds. Roasted broccoli also goes really well. 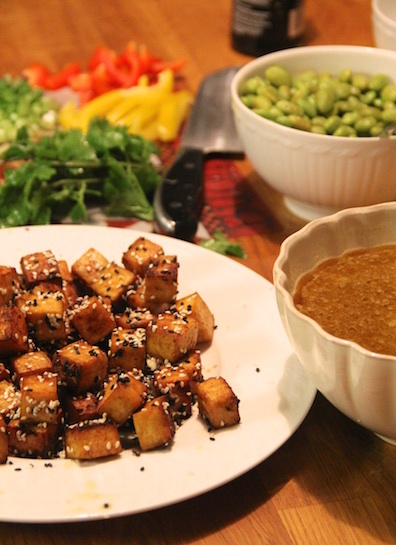 And finally, we pour on a delightful sweet sesame-ginger-garlic dressing (recipe follows), and mix it all together. It's fantastic! 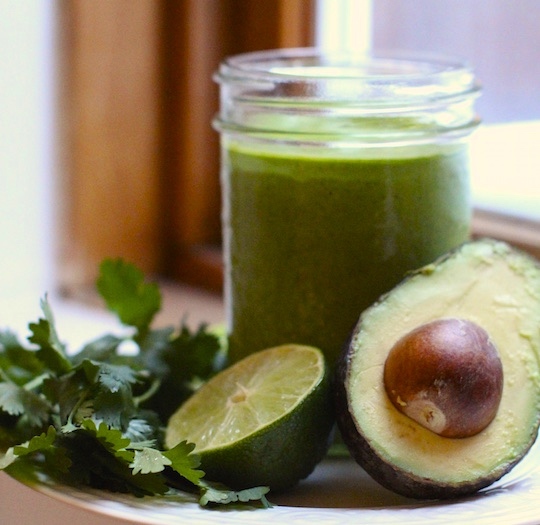 Mix all ingredients together (by hand or in a blender/food processor). Snap..I'm reading this as I'm waiting for my dinner to be delivered.. boohoo! But I'll bookmark these recipes for next week, they look delicious (and I could use a bit of healthy food too!). Does Zak like them? They seem too ''vegetably'' for my picky toddler (boohoo again). I've been looking for something savoury rather than sweet for breakfast, and better still, get some extra veggies in. These recipes will work perfectly, thanks for the posting, will try them! Hi! How well do you think the two sauces would stand up to freezing?? Thanks for the posting, will try them!.